Have you ever felt like you’re so rushed all the time that your mind becomes muddled and things slip through the cracks? I’m slowly learning to deal with this by applying a concept or rather a way of being known as mindfulness. 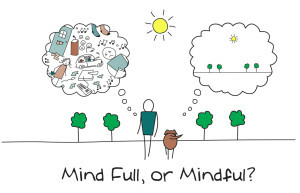 Mindfulness can be defined in different ways. In the context of practice in the health care profession, mindfulness is defined as purposefully paying attention to and observing the present moment in a non-judgmental manner, accepting reality as it truly is, and not how one would like it to be. The purpose of mindfulness is to be able to experience everything in everyday life, be it a clinical encounter with a patient, a surgery, procedure, or even a conversation, without being too rushed or diverted at any given moment. This therefore affects one’s assessment of a situation, one’s reaction to the situation, and hence one’s entire decision making process. I recall encountering a young woman in her early twenties who fled her West African country to escape her abusive spouse. Although this patient population speaks French, many expressions used in French in the Canadian context are not readily understood by them, and so patience and keen observational skills are key in successfully communicating and building a strong rapport with the patient. We were three in the room with the patient: myself, the resident, and the staff physician. This young woman presented with a complicated case of PTSD among other serious ailments which needed to be addressed immediately. Sensing that the patient was somewhat affected, I tried to speak to her simply while the resident and the attending physician completed the necessary paperwork. Quite quickly, I noticed that she appreciated how simply and clearly I spoke to her and how much more responsive she was to this particular manner of speech. When she was bombarded with more important questions, I sensed that she had difficulty understanding the attending physician, and so could not respond accordingly. I waited for the appropriate moment of silence to help clarify the physician’s questions. This was one simple moment of mindfulness where I observed the patient, became curious as to how she would respond to simpler language, and adjusted my response to the situation consequently. On another occasion however, in the same clinic, we encountered a patient in his early twenties who also fled his home country under unfortunate circumstances. He presented with clinical depression and another acute problem which also needed to be addressed. Refugees seeking status are promptly put in contact with PRAIDA (Programme régional d’accueil et d’intégration des demandeurs d’asile), a program which helps refugees find an apartment to reside in and provides them with myriad resources to ease their settlement in a foreign country. This particular patient required imaging studies for diagnostic purposes. The clinic that he went to refused to carry out the studies without being paid beforehand. Given that he did not have the money to pay for the imaging (he hadn’t yet found work), he presented to the clinic without it. At another instance during the encounter he mentioned, in passing, that he had limited resources to be able to eat according to the physician’s recommendations, since after paying rent there was little left of his monthly allowance (provided by the government). Many refugees find themselves in a similar position. However, with the help of the services offered by PRAIDA and the physician’s knowledge of the clinics which accept the coverage offered to this patient population, these patients are often very well taken care of. In the case of this young man, while managing his other conditions and completing the necessary paperwork, these details seemed to have been missed or overlooked. It was only after the patient left that we realized that we could have done more for this patient. This was an instance of mindlessness where I wasn’t listening as attentively to the patient as I should have been amidst the chaos of managing a complex case, therefore creating gaps in his care. In placing the patient’s delicate economic situation at the bottom of the priority list, it was almost completely forgotten! I failed to put myself in his shoes in order to understand his struggle. It was easier for me not to. It would have been too painful an experience, so I unconsciously avoided it. I did not take the time to understand how much it must hurt his pride to turn to us with his non-medical problems, although only mentioned in passing. I was not ‘self-aware’ enough at that given time to realize that important details were overlooked. This was a moment of mindlessness; one which I pray will not reoccur. The main point to take away from these stories is that in order to achieve optimal patient care, I believe it’s important to take those extra 10 seconds to consciously become more aware of our thoughts and feelings before and/or during a patient encounter, and to be more tuned in to the distractions that influence our judgement. Once we acknowledge our state of mind, it becomes much easier to gently bring our thoughts back to focus…. and we tend to make less mistakes.